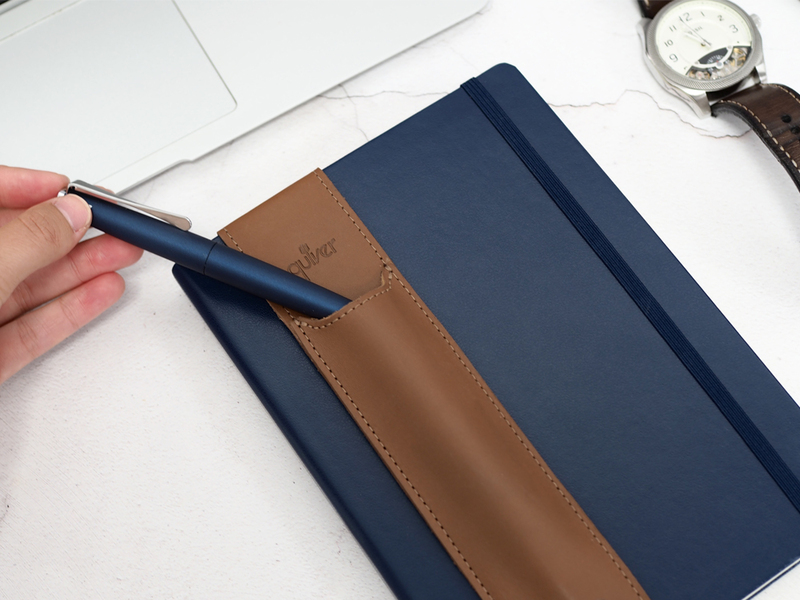 Designed to conveniently keep pen and notebook together, the Quiver leather pen holder can be a corporate gift in itself or a great addition alongside a branded pen; after all, you’ll get a much better return on your promotional pen investment if they’re always on hand for the recipient to use, rather than languishing at the bottom of a bag. We highly rate the Quiver leather pen holder as a promotional product, as it meets the three essential requirements of being: practical, good quality and perfectly suited for branding. Research has shown time and time again that in the B2B market, practical items bring the best return on investment for promotional products. It makes sense when you think about it – if you get something that’s useful then you’ll hold on to it and will keep holding onto it all the while it is useful. The Quiver leather pen holder has a practical function at the core of its design. It provides a protective case for the owner’s pen whilst keeping it attached to their notebook, forming a compact and portable unit ideal for busy professionals and those always on the go between meetings. Furthermore, unlike a pen loop attached to one notebook, the Quiver is easily transferable between notebooks. So if you have different notebooks for different projects or responsibilities, you can move the Quiver between books as you focus on each. Or if you’re someone who burns through notebooks at a rate of knots, you can keep on using the Quiver time and time again on any of your new books. If you want someone to keep the item you send them it needs to be of decent quality – this may sound obvious, but this thought often gets sidelined when deadlines and budgets take over. The Quiver leather pen holder scores top marks here. Handcrafted in the US by a small family-run company, the Quiver is made from genuine leather and stitched with marine-grade thread. 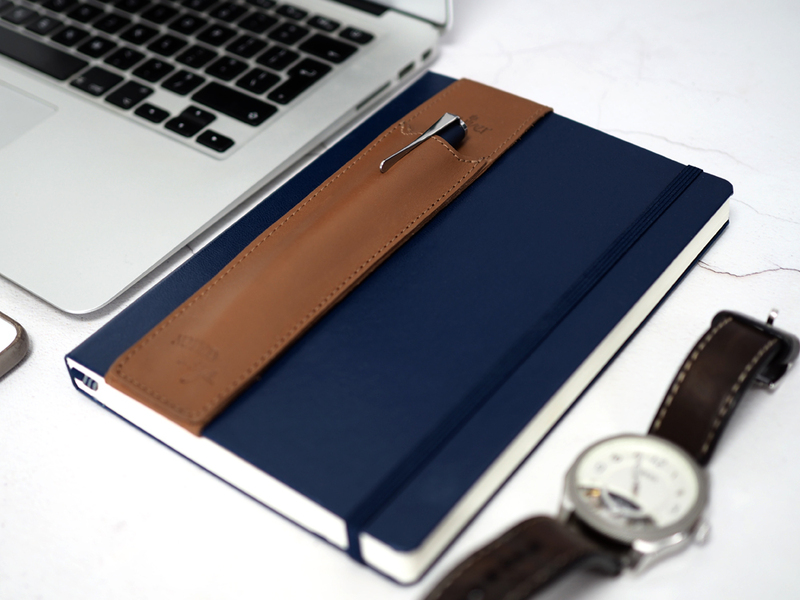 The neutral colours and simple design mean they compliment whichever notebooks they are paired with. Not only will the look and feel instantly impress the recipient ensuring that they keep it, but the quality of materials and craftsmanship will also ensure that the pen holder has a long lifespan. To promote your business, your gift needs to communicate with your employees, prospects or clients. This is usually done with a name, logo, or strapline of the business or particular campaign appearing on the product. The Quiver leather pen holder has space for branding on the front face. The leather debosses beautifully, leaving a deep impression of your logo or name that will never fade. A foil print would work just as well if you wanted to add a touch of colour. Although the item usually bears its name, ‘Quiver’, if you wanted your brand to be the only one appearing on the item, we can commission a batch to be specially made without its name on. So there you have it; the Quiver leather pen holder really does pack a mighty promotional product punch. 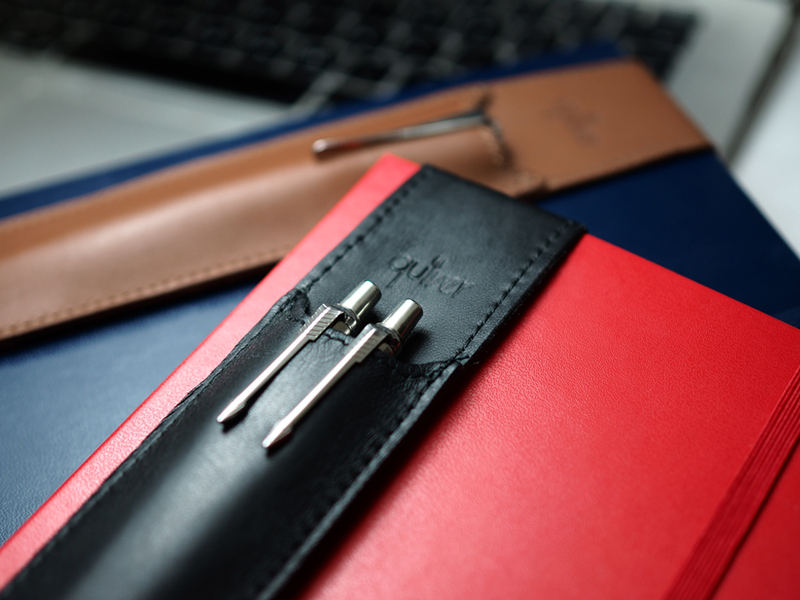 Contact us today if you’d like to know more about the Quiver or are ready to order your stationery gift sets of branded notebooks and pens, and want the addition of a beautifully debossed leather pen holder.